Hi everyone and welcome to Day 4. This will probably be quite a large topic so I will stick a Table of Contents at the top. That way you can skip to the parts that you are interested in, if you don't have time to read it all. 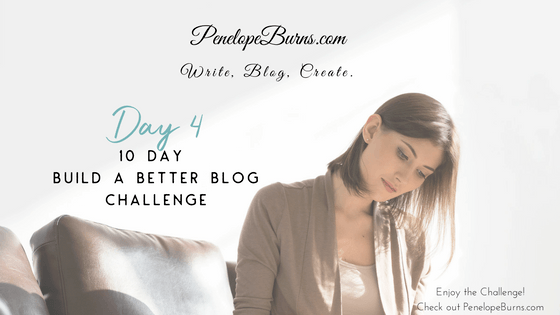 Today we are going to be looking at ways you can get ideas and inspiration for blog posts. I am not including the normal ones like social media, but will be looking at a few other ways. Depending on the niche and topic of your blog, some of these will work better than others. But give them a try. If you’ve been blogging for any length of time, you will have some older posts. They’re still getting a bit of traffic and there’s a lot of good information hidden in those posts. Some of the material may be outdated and your writing, formatting and image creation skills have come a long way since those early days. In other words, there’s a lot you can do to make these older posts better. You put a lot of time and effort into your blog posts. Why not make sure you get the most from them by going back from time to time reviving them? Instead of writing new content, schedule some time each week to revive an old post or two. Set aside a little time to revive old blog posts and turn them into traffic, subscriber and money generating machines. The whole point of reviving old blog posts is to make them relevant and then get more traffic to them, gain new readers and build a larger audience – without having to write fresh content. With that in mind, you want to pick some posts that are getting a decent amount of traffic and work on those first. They will have the biggest impact the quickest. To do that you want to look at your website stats. Do you have a tracking program installed? If you haven’t already done so, install Google Analytics on your blog. It’s free, very powerful and super easy to add. Once you have Analytics up and running, wait a few days to collect some useful data and then come back to this. Look at your stats and figure out what your most popular posts are. You can do this in Google Analytics by going to “Behavior - Site Content - All Pages”. That will give you a list of pages (or posts if it’s a blog) on your website ranked by how often they were visited. Browse through these pages and make a list of five to ten older blog posts to use in the next step. Grab that list of popular blog posts from step 1 and take a look at them. Does one of them stand out to you? Maybe it's a post that doesn't need a lot of work. Maybe you are looking at a post and you're already getting ideas for things you can do to improve it. Or maybe you have the perfect product to promote in one of the posts. How you choose the first post to work through is entirely up to you. Pick something that sounds interesting, fun or profitable. Got it? Great. If you are feeling ambitious, go ahead and make a list of posts you want to work on over the coming days and weeks. I find it helpful to have a list with the post title, the URL, and notes about what changes I need to make. A spreadsheet works really well for this. We've done the planning and figured out what blog posts need updating. Now it's time to get to work. The first thing we'll focus on is the content. Start by reading through your blog post. Is the content still valid? Have some things changed? Make note of any major changes you need to make to what you've written in the past. Sometimes the content is pretty evergreen and not much needs to be fixed. Other times, there's a lot of rewriting to do. The key is to have a plan and then just sit down and rework the post. Something else worth thinking about is if you have learned something new to share since you first wrote the post. If so, you can either just rewrite the post, or write an update section to the post. Depending on what makes the most sense, you can add it to the top or the bottom of the post. Take a look at the comments the post has received since you first published it. Are there any great tips or questions your readers have shared? If so, you may want to highlight them within the updated post. Make your changes, do your re-writing and save your work. Take a few minutes and think about what the purpose of this particular post is. Do you want to encourage readers to sign up for your list? Or can you think of a product that would complement your content? Either write a call to action toward the end of your post, or work your recommendation directly into the content. If growing your list is your goal, try adding a call to action and a signup form at the end of your post. This signup form can be different from the one you have in your blog sidebar. In fact, it should be so you can track where your signups are coming from. I find it helpful to craft a call to action that's directly related to the content of the post. I hope this was helpful and I'd love to stay in touch. Of course, raising a toddler is about more than "just" potty training. Ready for more Toddler Tips? Enter your email below to sign up to the weekly Toddler Tips newsletter. I'll also send you my ten best tips for dealing with temper tantrums. Another option is of course to promote a product in your post. Do something similar to what we did with the call to action to sign up for our list. Toward the end of your blog post, transition to a recommended product and let them know why you think it's a good fit, or why you think they should buy it. Better yet, make your recommendations right in the content itself. Once you do that, it starts to make sense to also incorporate product pictures. This is particularly easy to do if you are writing a blog post where you're reviewing a product. As far as monetizing old content goes, it can still make sense to work product recommendations directly into the content itself. Let's go back to our potty training example. As you go through the various signs to look for that let you know that your toddler is ready to be potty trained, mention that now would be the perfect time to order a potty seat. Then move into a product recommendation for your favorite potty seat available on Amazon.com for example. Just to recap, if your primary goal is to grow your list, grab the code for a new opt-in form and write a strong call to action that invites readers to sign up. If your main goal is to promote a related product, be it your own or something you're an affiliate for, think about how you want to incorporate it into your content. Grab your link and product images as needed and work them in. Don't fall into the habit of thinking that once you have published a post, it is done with. You may have learnt something new, improved the way you do things, or even have affiliate links you can add into older posts. If you write that the post has been updated on …, people can easily see that there is new content. Coming up with fresh content ideas for your blog isn’t always easy. Keep an eye out for questions in the comments. Save them and when you need a quick post, take that question – copy and paste it into your blog and answer it. That was easy, wasn’t it? If you answer yes to both questions (and you likely should), then the commenter question qualifies for a follow up blog post. And that’s exactly what it is; a follow up to the original comment question and your answer. Format it, add a graphic and you’re ready to hit publish. Readers love these types of posts because they often had the exact same question, but they were too shy to ask. If you find yourself with quite a few questions, you may even want to make this a new featured category on your blog. It will quickly become a valuable resource to your readers. It will save you time in the long run. By being thorough in your answer, it will not only apply to this exact question, but a multitude of related questions. As and when they pop up in comments, all you have to do is reply with a link to the post. Think of it as way to create your own personal FAQ section of the blog. Once you build a bit of a following with your blog, you will start to get questions and comments via email from your readers. Or you may find yourself chatting with a friend or fellow blogger about a topic, again via email. Take a look at your inbox and more importantly your sent folder. Chances are you’re doing a good bit of writing on a daily basis and much of it applies to your niche blog. Here is a simple little content recycle strategy that will turn those emails into evergreen content for your blog. The basic idea is simple. Anytime you write an email, be it a reply to one person, or an email you send to your list, ask yourself if this content could be repurposed into a blog post. For example, you may share how the conversation started or that you received a question from a reader in response to another post on your site. Then you would share the email they sent you (anonymously unless you’ve had permission to share their name) along with your reply. Next look at the messages you sent out to your list. This could be your weekly newsletter, evergreen helpful tips you send as broadcasts or even the emails that you compose in your autoresponder. Pick and choose through them and see what would also make a good blog post. Paste the entire email message into drafts and edit away. Maybe you can expand on an idea or tip, or maybe all you need to do is change a few words so it reads more like a blog post than an email. Anytime you don’t feel like writing much, or don’t know what to blog about, dig through your emails. I’m sure you’ll find something you can use. When you’ve been blogging for a while on a particular topic or in particular niche, it’s not uncommon to feel like you’re running out of ideas. It can even happen early on in your blogging career when you’ve got your first 10 or so posts under your belt. Or maybe you’re sitting there at your computer wondering if what you’re writing is what your readers are looking for. Once you’re starting to build a following and a readership, even if it’s small one, you can start asking your readers for topic ideas. This works particularly well if you have started building a list. In that case one of the emails you send to them on a regular basis is to ask them what else they would like to see on the blog. Otherwise, you can occasionally mention a request for topic ideas in your blog posts or on your social media posts. Or add a note to your blog side bar with a link to a post with a contact form. How you get the reader input doesn’t really matter. The important thing is to ask them what type of content they want and then accommodate them as and when it is appropriate. Don’t feel like you have to honour every request. Pick and choose the ones that make sense for your blog and that will benefit at least a few of your readers. Sometimes these requests will try to pull you off topic on your blog. Just ignore those and focus on the ones that makes sense for what you’re doing with your blog. How you make use of these requests is up to you. You can use them simply as suggestions and then write your own blog post on the topic. Or you can treat them similar to the email blog posts we talked about. In that case start with a little intro to the topic, copy and paste the reader request and then wrap it up with your reply. Sometimes this makes sense and it’s a great way to not only get the blog post written quickly but also share some social proof (you’re getting good questions and you’re taking the time to answer them on your blog). Other times the suggestions will be so vague that you’re better off writing a blog post from scratch. If you’re really lucky, you’ll get a great topic idea that will inspire a whole series of blog posts. Pick and choose and use whatever method works best for each request. I hesitate to write this as product reviews among bloggers and blog readers have a bit of bad rep. Over the past few years, many companies send products to bloggers for free along with a set of talking points or benefits to mention that have been crafted by their PR team and Advertising Agency. Let’s just say the end result wasn’t always an honest review of the product. Some people were just writing reviews to make money and hadn't even tried the product. That said, I think there’s still a place and a need for good product reviews and they can make great content for your blog but you’ve got to do it right. Readers can spot a phony review from a mile away and it will hurt your credibility. An honest review of a product you’ve actually used on the other hand can be very helpful. Only review products you’re actually using and are finding helpful or worth the money. Don’t review something just to make a quick buck on a sponsored post or affiliate commission. Keep the big picture in mind. You want to be a source of value to your readers. Additionally I recommend you only review products you’ve bought yourself. Mention that in the review. It adds a lot of credibility to your product review but it’s also a good filter for what to review. If you wouldn’t buy it, why would you expect your readers to fork over their hard earned money? Use the product and put it through its paces. How is it working? How is it holding up? What do you love about it, what do you hate about. Who would you recommend it for and is it something you’ll continue to use. That’s all valuable information that your readers are looking for. Use your own pictures and possibly even unboxing videos and demos if you can. Don’t be afraid to point out anything you don’t like about a product. Let your readers know if you think it’s a deal breaker, or if not, how you’re getting around it or why you’re continuing to use it despite the drawbacks. Maybe a kitchen appliance isn’t easy to clean, but it does such a great job that it’s worth the messy clean-up job. Mentioning anything you don’t like about a product again lends credibility to your review. Your readers will pay more attention and be more likely to take you up on the recommendation if you sound credible. Try it. Implement these tips and product reviews can become a very educational, popular and potentially profitable part of your blogging schedule. Whenever I start to run out of blog post ideas, or have a general idea what I want to blog about but not the exact topic or title, I head on over to use the Google Keyword Planner tool. To find it search for “google keyword planner”. It will pop right up for you. The tool is part of Google AdWords, and you will need a Google / Gmail account to sign up, but there’s no fee for using the tool. All you do is set up a free AdWords account and you’re good to go. No need to buy ads or add money to your account. Next I click on and look through each of the groups of keyword ideas. Here’s a screenshot of the “start blogging” group. 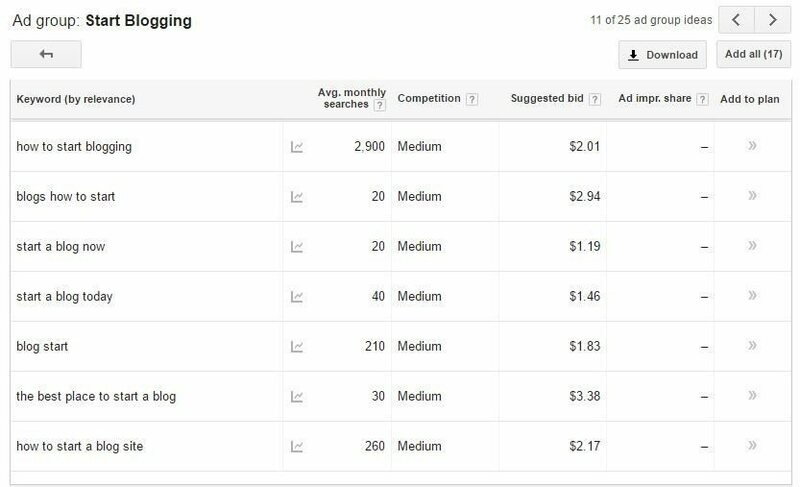 Not only does it give you a list of keyword ideas to choose from, it also shows you how many average monthly searches each term gets. Why is this important? Let’s say you want to write a blog post about starting a blog and ideally you want to rank for your chosen keyword. You would end up with a lot more search engine visitors if you use and rank for “how to start blogging” than if you use “start a blog now” or “the best place to start a blog”. If you’re brainstorming topic ideas, start broad with a few different key terms for your niche. In the blogging niche, I may start with terms like blogging, blog, WordPress, hosting, commenting etc. Then narrow it down and come up with a list of terms you want to craft blog posts around. You can sit down with this tool for 30 minutes and easily come up with a list of several dozen blog post ideas. Turn each keyword into an attractive, attention-grabbing title, save it in drafts and you’re good to go as far as blog post planning is concerned for the next couple of months. The second way I like to use this tool is to come up with a good title for a post idea. Let’s say you have a general idea of what you want your post to be about, but you’re not sure exactly how people search for this kind of topic. But your general keyword into this tool and you’ll get a list of search terms. 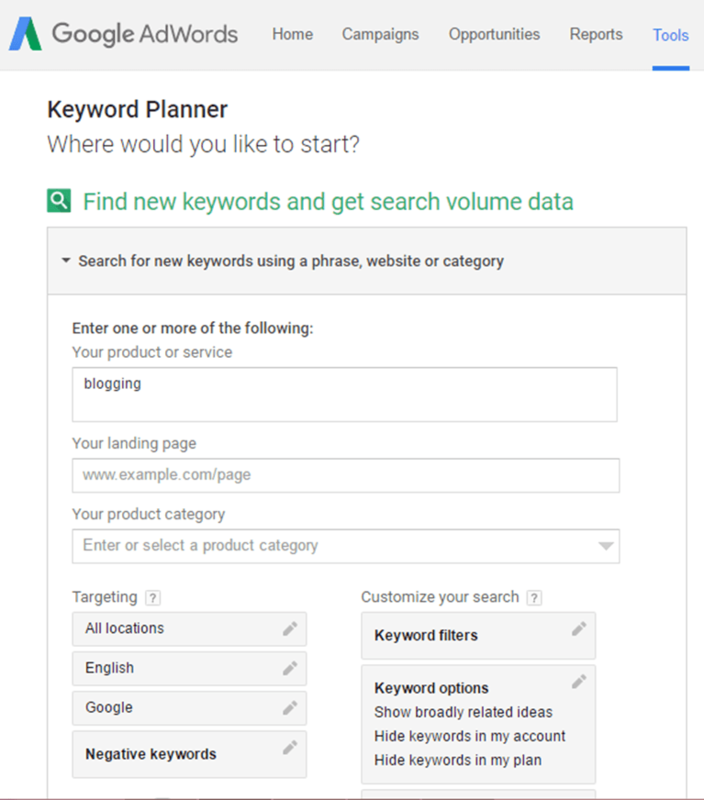 If you’d like, you can play around with several different keyword variations until you find one that gets a decent search volume, but not too high of a competition. Pick the keyword you want to use and then as before craft your title from there. We talked about using the keyword planner tool to come up with blog post ideas. Another tip is to use a blogging planner to come up with almost endless blog post ideas and make sure they work well depending on time of year etc. Come up with your own niche specific blogging calendar. The idea is to come up with a couple of vague themes for each month, or even each week. To make your own blogging calendar, get out a monthly calendar, or grab a notebook and dedicate a page to each month. Next, look through your regular calendar and make note of seasons and holidays. Jot down a few blogging ideas for each in the appropriate months. For example, if you’re a food blogger, you may want to plan some grilling recipes for May in celebration of and preparation for Memorial Day and some red white and blue dishes for 4th of July (in the US). You can get also find all sorts of funny, interesting, and obscure holidays online. There’s a pancake day, a hot chocolate day and more. Daysoftheyear.com is a good resource for finding wacky holidays you can blog about. Another great option is to leverage the research, magazines in your niche carry out. Head online or dig out your stack of saved magazines and look at the covers. You can usually figure out general themes for certain months. Take note of those themes and see what you can use with your own blog. The nice thing with any blogging calendar is that you can write it out once and then use it for years to come. Sure, you can add and change things out, but the basic structure is there and if you keep the themes and ideas loose enough, you’ll come up with fresh blog post ideas year after year. One of the great things about blogging is that you can build a community around your blog. You are a group of like-minded people or those with similar hobbies or lifestyles. Here is another idea that involves your readers and gives you plenty of fresh blogging topics and ideas. This tip is similar to using readers questions, but now you’re asking your readers to share their best tips. Readers will come up with some interesting ideas. Not all of them are viable for publishing on your blog, but you’ll be pleasantly surprised how many ideas and tips are helpful and make excellent starting points for blog posts. Start by asking your readers for tips. This can be as open ended or specific as you’d like it to be. You can write up a blog post and frequently share it on social media and via email, or you can write up a quick email that goes out to your subscribers. Just resend it anytime you start to run out of ideas or tips to share. You can have your readers email you back with their best tip and idea and make it clear that you may use these tips on your blog. I also find it helpful to ask my readers how they would like me to share the tip. Some prefer an anonymous tip, while others are proud to see their full name and link to their own blog on my site. Most fall somewhere in-between. You have a couple of options about using these tips. The simplest is to copy and paste the tip and the readers name in a new blog post. Another option is to start with the reader tip and add your own two cents as well. This will end in a longer blog post. Or you could compile several related reader tips and just add your own introduction to the post. No matter how you use these reader tips, they will help you come up with fresh blog post ideas on a regular basis and they will help your readers feel more engaged and more a part of your community. Give it a try. Another great way to revamp old content is to re-purpose it. Re-purpose your text and images by turning them into videos which you then distribute to YouTube and other video sharing sites along with a link back to your blog. People especially love tutorials so if there is a way you can create a video or series of videos that teaches then how to do something and that also relates to your niche then so much the better. You may draw in a whole new audience with a different style of content. Don’t forget to post your videos on your own blog for yet more Google love. As Google now owns YouTube, video is a star performer when it comes to ranking fast and high, ramping up that traffic even more. Embedding videos in your posts is known to lead to more engagement. If you’re not engaging your visitors, your blog can’t thrive. And not all “readers”, are responding well to text. Yes, a blog is a written medium, but thanks to technology, we have options. We can embed audio and video files into our posts. And if you’re using WordPress, it’s very easy to do. Either totally revamp the written content into a video, or add a video to enhance the written content that is already there. Keep things interesting for your readers by adding videos where it makes sense. This will keep readers on the page longer. We may not always sit down and read a long blog post, but we may watch a video. And that means your visitors stay on your site longer, which in turn will help you with Search Engine Results. But what type of content should you include? You can record a related video on your phone and then upload it to YouTube, or you can host a Google Hangout Live which will automatically be recorded and uploaded to YouTube. Keep in mind that the video should enhance your content. Let’s run through an example to make that a little clearer. Let’s say you’re in the gardening niche and you write a blog post about growing tomatoes from seeds. Your post walks them through the process step by step and one of those steps is to eventually replant the tomato seedlings in your garden bed. You could include a video where you show them how to do the replanting. This would be a good example of a post where the video enhances the rest of the blog post. This tip is another great way to showcase some of your older blog posts and get them a little extra attention. I’m sure you’ve seen “Best of” blog posts across the web. But have you ever done one of your own? Even if you have, I’m sure there are plenty of other compilation posts you could put together. If you’re not familiar with the idea, let me give you the quick rundown. A “Best of” Blog post is nothing more than a list of links to posts on a related topic. Let’s say you have a recipe blog where you share a variety of recipes. You could do a post about no-bake desserts or kid-friendly slow cooker recipes. You introduce your readers to the topic and then just make a list of all the recipes on your site that follow that theme. Link to them all and if you’re feeling ambitious, add a little paragraph about each recipe and a picture of the dish. You can do this for any type of blog. If you blog about online marketing, make a best list building tips post. If you’re blogging about weight loss, write up a best weight lost tips and tricks post. If you’re a parenting blogger, share 15 easy summer crafts to do with the little ones. Just look through your blog and see what posts you can compile into a “best of” type post. Don’t think that you’re limited to your own blog posts. There’s no reason why you can’t link to posts by other bloggers in your niche. It’s a great way to support your friends and get to know other bloggers. Who knows, you may find other ways to collaborate once you establish that relationship. Just don’t use anyone’s images or more than a snippet of text without their permission. Give it a try. Browse through your blog posts and make a list of thematically related posts. I find it helps to focus on one category at a time, since those topics already follow a general theme. Then get to work, and start a few “best of” posts in drafts. They’ll be ready and waiting for you anytime you need to publish a post. Best of all, since these posts are such a treasure trove of information on one specific topic, they are much more likely to get shared around. Especially if you take the time to come up with a catchy title for your post and create a pretty collage image that makes it easy to share on social media. So, these are your tips for Day 4. Make a note of the ones you are going to try. Let us know if you have any more!